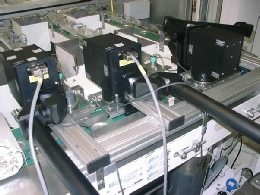 Our special purpose laser solutions can take the form of a stand-alone workstation or be part of a process where additional operations are carried out on the product such as in bespoke assembly or test and inspection systems. Whatever the case, the laser enclosure is designed to comply with all current legislation and is fully interlocked to ensure safe operation. CS Automation is experienced in laser integration and have supplied solutions for laser marking, welding and cutting applications. CS Automation work closely with various laser suppliers to ensure the most appropriate laser is selected for each project. Depending on the application, we can provide manual, semi-automated or fully automated custom built handling solutions and we have experience with different laser types such as Nd:YAG diode, lamp pumped, and CO2 lasers.